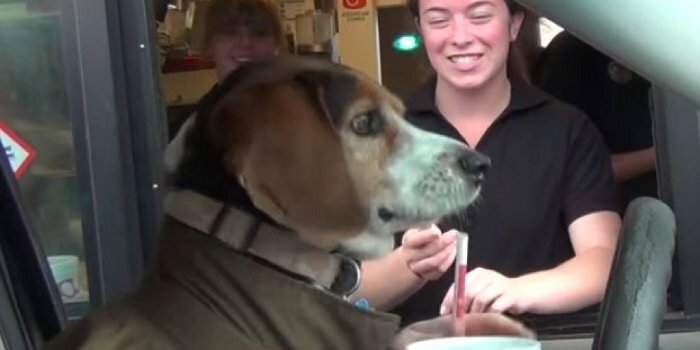 Dog In The Drive Thru Is The Cutest Prank Ever! - 2NGAW! Dog In The Drive Thru Is The Cutest Prank Ever! If you are a frequent visitor on our website, you’ll know that most of the news we feature here are those of the bizarre. We love writing and sharing stories about weird and strange incidents from across the world. For this entry though, we’d like to step back from the usual stuff we churn out and just post about a feel-good video we came across with on YouTube as of late. It’s all about a dog who ordered food on several drive-thrus. Well first-off, the video was created by JStuStudios, a YouTube channel famous for their pranks. For this one, they thought it would be pretty funny to know how drive-thru crews will respond if they find out a dog has just ordered from them. So they put the beagle named Beauford in the driver’s seat while one of the pranksters sat behind him to drive the vehicle and “act” as the dog’s hands. The other prankster, on the other hand, was there to film the entire thing with a camera. The results were absolutely hilarious! The pooch made a lot of people smile and many wanted to give him a dog treat. The first girl quickly quipped “You are such a handsome guest, sir. Would you like some water” to which the “dog” replied “Yes, please.” Everyone at the store had a good laugh. The next girl asked offered to feed the canine with some bacon. She dropped the strip at the first attempt though but she went back and got some more. This simple prank definitely made everyone smile (well actually – almost everyone). Kudos to the guys over at JStuStudios for taking the time to brighten the day of these fast-food workers! Watch the video here and feel free to share this story with your dog-loving buddies.